The Bingham School was actually a series of classical academies overseen by three generations of the Bingham family over a period of 135 years. The esteem in which these teachers were held was such that any school they managed came to be known as the Bingham School. The first schoolmaster in the line was Presbyterian minister William Bingham, born in Ireland and educated in Scotland. He emigrated to Wilmington and set up a school in 1793. After serving in a number of educational posts, he established a school of his own at Mount Repose, northwest of Hillsborough, where he had settled as early as 1816. A log cabin served as the school building, and other cabins accommodated his 35 to 40 students. During the spring term in 1826 Bingham died, and his son William James Bingham finished the term in his place. The younger Bingham, university educated and trained in law by legislator and jurist Archibald D. Murphey, found teaching to his liking and became principal of the Hillsborough Academy in 1827. Under his direction the school thrived and attained a national reputation for excellence. In 1840 his brother John Archibald Bingham joined the school's administration. In 1844 William James Bingham moved to Oaks, southwest of Hillsborough, to establish what he called a select classical and mathematical school. Bingham reduced the enrollment from the 100-plus students at Hillsborough to some 30 in order to give them closer personal attention. He also managed a model farm to experiment with new strains of seed and new methods of cultivation. Bingham's illness in 1855 closed the school. In 1857, however, Bingham's sons William and Robert joined him in partnership, and the school reopened, with double the enrollment, as W. J. Bingham and Sons. In 1863 the elder Bingham's illness and Robert Bingham's absence in the army obliged William Bingham the younger to take over operations. In 1864 all three Binghams and their families moved with the school to a new location on the North Carolina Railroad east of the town of Mebane, where it became officially known as the Bingham School. In 1866 William James Bingham died, and his sons took over the school. William Bingham, admired for his musical and literary accomplishments as well as his pedagogy, wrote textbooks that became standard works in American schools, including a Latin grammar (1863), an English grammar (1867), and an edition of Caesar's Commentaries (1864). He died in 1873. His brother Robert made several improvements to the school, both in its buildings and curriculum. His efforts, however, were undermined by serious family complications regarding financial interests in the school, and in 1891 he established his own Bingham School on 250 acres overlooking the French Broad River in Asheville. This incarnation of the Bingham School featured the first gymnasium and swimming pool built in the South specifically for school use. The Bingham School operated successfully until its closing in 1928, one year after Robert Bingham's death. Sallie Bingham, Passion and Prejudice: A Family Memoir (1989). Robert I. Curtis, "The Bingham School and Classical Education in North Carolina, 1793-1873," NCHR 53 (July 1996). Robert H. Stone, A History of Orange Presbytery, 1770-1970 (1970). Bingham Military School Volumes, 1872-1876; 1890-1919 (collection no. 03730-z). The Southern Historical Collection. Louis Round Wilson Special Collections Library. University of North Carolina at Chapel Hill. http://www.lib.unc.edu/mss/inv/b/Bingham_Military_School.html (accessed March 15, 2013). 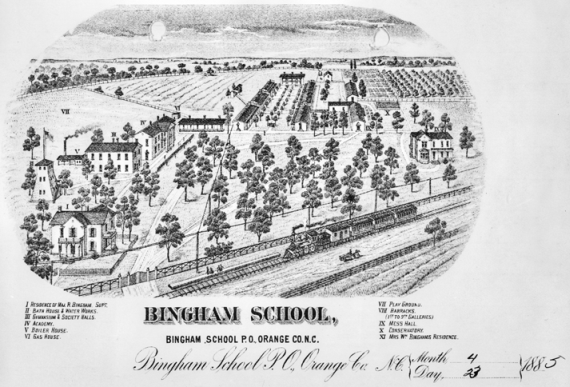 Bingham School (Orange County, N.C.). The Bingham School Catalogue. Lynchburg, Va.: J. P. Bell Company. 1905. https://archive.org/details/binghamschoolcat19051906 (accessed March 15, 2013). "The Bingham School-Its Past, Its Present, Its Future." Biennial Report of the Superintendent of Public Instruction of North Carolina part 2. Raleigh: Guy V. Turner. 1898. 146-170. http://books.google.com/books?id=9AnNAAAAMAAJ&pg=PA928#v=onepage&q&f=false (accessed March 15, 2013). "Faculty of Bingham School, Mebane, N.C." Biennial Report of the Superintendent of Public Instruction of North Carolina part 1. Raleigh: Guy V. Turner. 1898. 21. http://books.google.com/books?id=9AnNAAAAMAAJ&pg=PA764#v=onepage&q&f=false (accessed March 15, 2013). My grandmother, Flossie Stone Hill, "Nana," was born in 1890). She grew up at Mount Vernon Springs, near Pittsboro, in Chatham County. She told me many times of the stories she heard and the information that was shared with others concerning the school for young men. They were schooled very close to Mount Vernon Springs. On Sundays and other special days the professors joined her family. I do not think that women were allowed to attend more formal dinners unless they became part of the kitchen crew. Nana, easily bored, liked to listen and to always learn. Nana had two twin brothers, George "Hannah" Stone and Isaac, "Ike"Dunlap) Stone. I have a few good photos of them. Nana lived to be 93, and her mind remained very clear. I held her hand as she slipped away. She said, "Live as you should and we will spend eternity together." I would love to know if any of my "Bynum" family, who lived in the Pittsboro area in the 1800s, ever attended one of the Bingham schools. My great-great grandparents were Turner and Julia Ward Bynum, and my great grandmother, their daughter, was Martha Eliza Bynum (Hawkins). There were also boys and at least one other girl in the family. My great grandfather James Hillary Jeffress attended the Bingham School sometime between 1870-1880 (I guess). He received a medal/badge while he was there which we still have. We would like to know exactly when he attended and what the medal was for. I'm trying to find some information about my great grandfather, William Cofield King, who was a student at this school. I am trying to find out when he attended there. he would have been enrolled there around 1915-1917, possibly earlier. I know he enlisted in the world war I draft in 1918. Any personal information you may be able to point me in the correct direction to would be much appreciated. THank you. Thank you for visiting NCpedia and taking time to share your history and question. I am connecting you by email with the N.C. Government & Heritage Library. A reference librarian will contact you shortly to help suggest some resources for your question, if you are still looking for information. I am searching for student lists. My grandfather went to Bingham. John Lindsay Efland, Efland was the town next to Mebane. I wanted to find what years he went and what study. He was a very successful business man. 1871-1968. I’m forwarding your question to Reference Services at the NC Government and Heritage Library. A librarian will contact you soon to help you find more information, if you still need it. Hi -- Thanks for providing additional information about the history of the Bigham School. The comment feature allows viewers like you to contribute their ongoing learning to entries for the benefit of all. NCpedia does not publish user contact information (such as email addresses or telephone numbers) with user comments so we have removed your email in publishing your comment. However, please feel free to continue to share your research and new sources with NCpedia for this entry and others. Thanks for your comment and good luck with your research! Thank you for providing additional information about the Bingham School. We appreciate your comments. Here's the (Mebane) Bingham School Catalogue for 1905-1906.